We pride ourselves to be the very first clinic to introduce the revolutionary Cellulaze Laser into the UK and Europe by Mr Ayham Al-Ayoubi in 2011. Since then he has pioneered Cellulaze laser in the UK and worldwide. Cellulaze laser is the World’s first Aesthetic laser with a minimally invasive surgical approach to treat cellulite beneath the surface of the skin for long-term reduction of cellulite in both Men and Women. Cellulite is enlarged pockets of fat that are pushed towards the skin’s surface by tight, inflexible connective tissue. It’s a problem that plagues even thin women. A healthy diet, along with regular exercise, can minimize the appearance of cellulite, but diet and exercise alone will never completely eliminate it. An estimated 85 percent of women and 20 percent of men over the age of 20 are affected by cellulite, a degenerative and largely untreated condition in which dimply herniations and depressions develop within the layers of the skin. 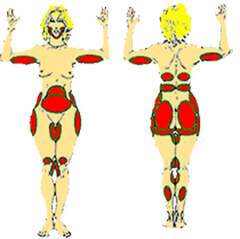 The before and after photos above are just an example of Cellulaze Treatment. The results are various from one patient to another and there is no guarantee that all patients who will have this procedure will have similar results. Cellulaze is a breakthrough, revolutionary cosmetic, FDA-approved laser surgical procedure that wages a relentless war against cellulite and provides scientifically proven, enduring results with a laser device designed to reduce cellulite by restoring the normal structure of the skin and underlying connective tissue. The cutting-edge, minimally-invasive laser treatment stretches the skin’s natural thickness for a smoother, firmer, more youthful look. Cellulaze distinguishes itself from other cellulite treatments, because rather than simply targeting the skin, it focuses on the structural causes of cellulite that lie well below the skin. Patients can see a remarkable difference in cellulite appearance after just one laser cellulaze procedure. Milliones of women want to look and feel better about themselves and get read of Cellulite permanently. Despite the fact that they work out and lose weight, some pockets of fat and cellulite are simply impossible to reduce or to shift. Cellulaze laser had proven to be a safe and simple way to remove those cellulite and stubborn fat deposits, using a specially designed powerful laser to sculpt the body contours and to permanently cellulite fat cells. Furthemore, the laser energy interacts with the skin which results in proper skin shrinkage and tightening, thus significantly reducing cellulite and lose skin. The results of the treatment have been simply outstanding. 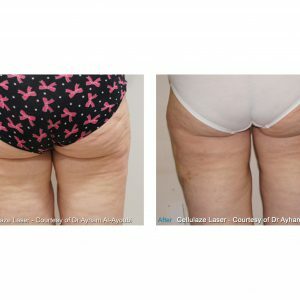 The Cellulaze laser procedure can be done under local anaesthesia, but it would be better to carry it out in some cases under light general anaesthesia, as a day case surgery, this means, that the optimum amount of laser energy can be applied, whilst the gentle suction of fat ( if needed) can be done in large areas to give immediate results of fat reduction. In most of the cases , some visible results are seen immediately, however, it will take 3-6 months to start seeing significant results of the treatment. If large amount of cellulite have been treated, a stepped programme will probably be advised to help speeding the process of cellulite reduction. The benefits of Cellulaze include using the most advanced and sophisticated laser technology, targeting cellulite tissue and fat, with the ability to tighten the skin and coagulate small blood vessels (stop and prevent bleeding). In addition, there will be small skin incisions made, 1-2 mm, which will fade away after 2-3 months. Also, a gentle suction ( if needed) of the liquefied cellulite fat on the desired treated areas which will give immediate results. Patients can go to work the next day, or the day after the procedure, and they can go to the gym after seven-ten days. The Cellulaze laser is designed to diminish lumpy pockets of fat, release areas of skin depression and increase elasticity and thickness of the skin. Patients usually require just one treatment. 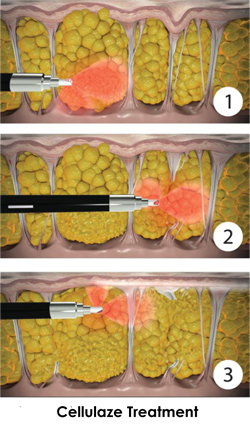 Cellulaze laser technology, offering a light-based solution for the treatment of cellulite. The system has a solid state Nd: YAG emitting light in the 1440-nm wavelength. Cellulaze laser proprietary SideLight 3D side-firing technology directs controlled, laser thermal energy to the treatment zones – typically the buttocks and thighs. In the Cellulaze laser surgical procedure, which is performed under a local anaesthetic, IV sedation or light general anaesthesia, the surgeon inserts a small cannula – a narrow tube the size of a pen tip, under the skin. The Cellulaze laser treatments have demonstrated a benefit from the use of subcutaneous laser energy in terms of tissue tightening through tissue coagulation as well as the regeneration of collagen and connective tissue. Cellulaze laser has received FDA approval in the USA and CE Mark certification in Europe and research demonstrates long-term improvements in skin elasticity and skin thickness. Cellulaze Laser is equipped with two important and unique features, the SmartSense and the ThermaGuide. The SmartSense is inserted into the Cellulaze handpiece with an advanced microchip, or accelerometer of the laser enrgey. Based on the setting (high, medium, or low) and the motion of the intelligent handpiece, the precise laser power is metered and delivered. Therfore, If handpiece motion ceases, the laser stops firing to prevent overexposure, but remains ready and resumes firing when the handpiece is set in motion again. The Cellulaze laser is also equipt with a unique safety feature, the ThermaGuide, which monitors and controls the temperature of the liquefied fat and skin in the treated areas. The ThermaGuide constantly measures the temperature under the skin and controls the output of energy, ensuring that the treatment area stays within a safe range so that it is hot enough to work efficiently, but not so hot as to cause the patient harm. The ThermaGuide temperature sensing cannula has a thermistor near the treatment tip of the fiber that profiles temperature subdermally near the treatment site. This information is relayed back to the laser. Smartsense with ThermaGuide is the only device that incorporates intelligent sensing near the treatment end of the cannula. ThermaGuide provides temperature feedback to deliver the appropriate level of laser energy so it gives best safety and prevent burns of the fat and sounding tissues including the skin. The ThermaGuide cannula contains a sensor which measures tissue temperature with the laser workstation calculates average temperature and displays it on the scree. Then the laser energy is delivered until the target temperature is reached, for a safer and more uniform treatment with the sophisticated software allows to select temperature settings to both warn the surgeon and then reduce the laser energy when subdermal temperatures exceed target temperature. At our clinic, Cellulaze laser treatment is performed by Mr Ayham Al-Ayoubi, the UK’s leading Cellalaze and Smartlipo surgeon. Respected both nationally and internationally as a leading surgeon, lecturer and tutor, he is a pioneer of new techniques and surgical innovations. By creating and applying his own advanced techniques in laser surgery, Mr Ayoubi has inspired plastic surgeons and cosmetic doctors to follow his lead. Through his commitment to innovation, medical excellence and the highest standards of patient care, Mr Ayham Al-Ayoubi has gained an unrivaled reputation with patients travelling from all over the world to have him perform Cellulaze laser body sculpting treatments.